In many ways, it’s been all about the people – five decades of forward-thinking arts advocates, civic and business leaders, arts patrons, individual artists, volunteers and arts professionals – coming together to create a one-of-a-kind organization: ArtsWestchester. It began as a conversation among volunteers in a living room in 1965. 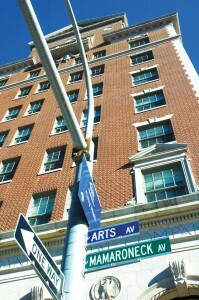 Now it is a nationally recognized private arts council, the largest of its kind in New York State. ArtsWestchester celebrates 50 years of service to the region at a golden gala on November 20 at the Ritz-Carlton in White Plains. Working in partnership with ArtsWestchester over five decades, Westchester County Government, the New York State Council on the Arts, the NEA and thousands of dedicated individuals have contributed to the growth of the cultural industry in Westchester to an economic impact of more than $156 million. ArtsWestchester itself distributes more than $1 million annually to nearly 150 cultural organizations and individual artists. Beyond economic impact, the arts strengthen community life, enhance Westchester’s reputation as a desirable place to live and work, enliven our urban centers, and engage kids in challenging, productive activities. In 1998, ArtsWestchester acquired and renovated a historic nine-story bank building in downtown White Plains, demonstrating the transformative role of the arts on economic revitalization. Now, what was a vacant building is filled with the creative energy of artist studios, a gallery and performance venue open to all. Today, the arts continue to thrive in Westchester County, in part because ArtsWestchester in partnership with the county has put the arts on the public agenda and invested more than $35 million over the years in arts and culture in the County. The bottom line is that investment in the arts is good for the economy and right for Westchester’s quality of life.